Coconut and cashews come together for the perfect afternoon indulgence. In case you haven’t noticed, bliss balls have been popping up all over the internet for quite some time now. Otherwise known as protein balls, snack balls or any other number of names, they all have one thing in common which makes them very popular- there’s no cooking involved. These tasty snacks are made with a mixture of nutrient dense ingredients, which usually includes nuts and dried fruit. Other ingredients can be added such as different grains (like oats or millet), seeds (like flax or chia seeds), flavorings (like cocoa powder or vanilla extract) and other add-ins (like protein powder or chocolate chips). All of the ingredients get pureed together in a food processor and then they’re rolled into bite sized balls. They can be served as is or can be coated in ingredients like shredded coconut, sesame seeds, chopped nuts or cocoa powder. Then they’re ready to be devoured. Quick, easy and nutritious- no wonder they’re so popular! beverage. Although it comes in three different flavors, I was particularly intrigued by the Toasted Coconut & Cashew flavor. Toasted coconut and cashews in a delicious, creamy beverage- how can you go wrong? Silk Nutchello is a dairy-free, nut-based drink that’s made with no artificial colors or ingredients. The Toasted Coconut & Cashew is smooth and satisfying and has only 80 calories per serving. It’s the perfect afternoon indulgence and is best served over ice. I wanted to create a dish that would perfectly complement the Silk Nutchello so I decided to try my hand at a bliss ball recipe. I have to say, I am so glad I did because they turned out amazing! 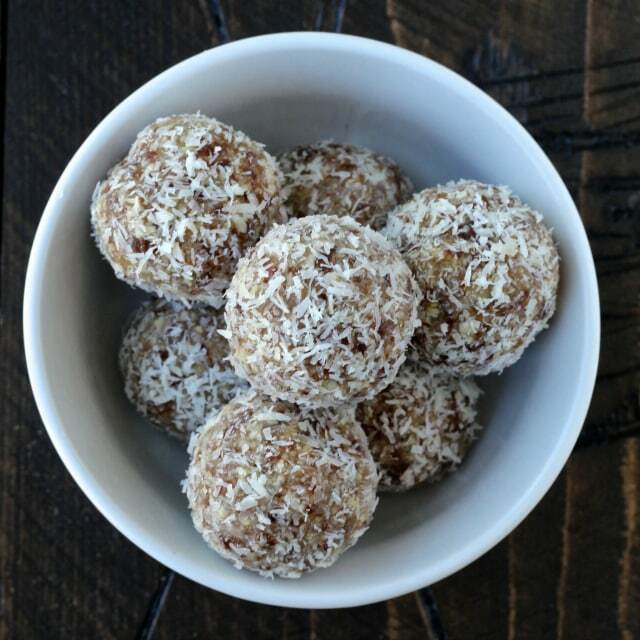 My Coconut Cashew Bliss Balls are made with only a few wholesome ingredients and come together in minutes. They have no added sugar but instead are sweetened naturally with dates. Plus, they’re dairy- and gluten-free. You can make a whole batch and store them in the fridge for about a week (but I doubt they’ll last that long!). First, I pureed cashews, dates and shredded unsweetened coconut in a food processor until finely ground. Then I streamed in a little coconut oil and water until the mixture looked like wet sand. Then I let the mixture firm up a little in the fridge before forming them into bite-sized balls, about a heaping tablespoon each. Finally, I rolled them in shredded coconut and the balls were ready to be devoured. I even had some adorable mini cupcake liners that made for a really pretty presentation. These Coconut Cashew Bliss Balls are the perfect accompaniment to the Toasted Coconut & Cashew Silk Nutchello. Do you get tired, cranky and hungry (or hangry, as I like to call it) in the late afternoon? Around 3 pm is usually when I get hangry and starting looking around for something to snack on. Don’t fall for the vending machine trap. The next time you’re in this situation, dive into one of these nutrient-dense bliss balls instead. It will satisfy a serious sweet craving and it will make you feel like you’re indulging even though you’re not. Enjoy it with a cold glass of Silk Nutchello instead of your usual coffee, tea or soda. It’s the ultimate pause button in a glass. Pulse the cashews in a food processor several times until no large chunks remain. Add the dates, ½ cup coconut and salt and continue to process until a crumbly mixture forms. With the food processor running, pour in the coconut oil and water and process until the mixture looks like wet sand. If needed, add a little bit more water until it holds together. Refrigerate the mixture for about half an hour to firm up a little. Then, scoop out heaping tablespoons of the mixture and roll them into balls. Pour some shredded coconut onto a plate and roll the balls in the coconut until they are coated (I used about 2 tablespoons). Devour! So have you tried making bliss balls yet? What’s your favorite flavor combination? Love the coconut-cashew combo! These are the perfect little snack! Thanks so much! I love the combination too! These sound amazing and SO perfect for a late-night snack! Oh goodness, these look amazing. I love anything with coconut and cashews together! Now that's a novel idea!! It's embarrassing how many bite recipes I have, but the possibilities and combos are so endless! I just recently spotted Nutchello – now you've convinced me that I need to break down and pick up a bottle! Love the recipe pairing – coconut and cashew are a match made in heaven! Oh these look so good! I love coconut paired with any kind of nut! Love anything coconut, and these looks so intriguing, Sonali. YUM! I've been wanting to try that Nutchello. Looks like a really tasty treat!! And those bliss balls?! YUM! Thanks Tara! This flavor was awesome and I can't wait to try other two! These look good, and healthy for you! They're a snack I wouldn't mind having around the office for those hungry afternoons. These look so good! I love the flavors in it. Great pictures too– so pretty! Seriously these balls sound so good. I've been such a big fan of coconut lately, I'm obsessed! How fun would that be! Thanks Emily, the Nutchello was so delicious! What a perfect flavor combination! Easy to make too!